I’ve done a couple of presentations around here in the last few weeks. Below you’ll find the Slideshares to each. I find Slideshares to be mostly useless, so if you have any questions, @drewmillikin. This is a presentation I did for our admission office. It’s basic overview of our four core social media tools: Facebook, Twitter, Blogs, and now Instagram. This is one that I just gave to a small group of trustees. It’s a case study of how we used social media to share the announcement of our new headmaster. You’ll remember (or perhaps not) that I had some surprising success last year live streaming an event here know as Lessons and Carols. Last year, it was a simple one camera in the back of the Chapel hooked into my MacBook Pro. 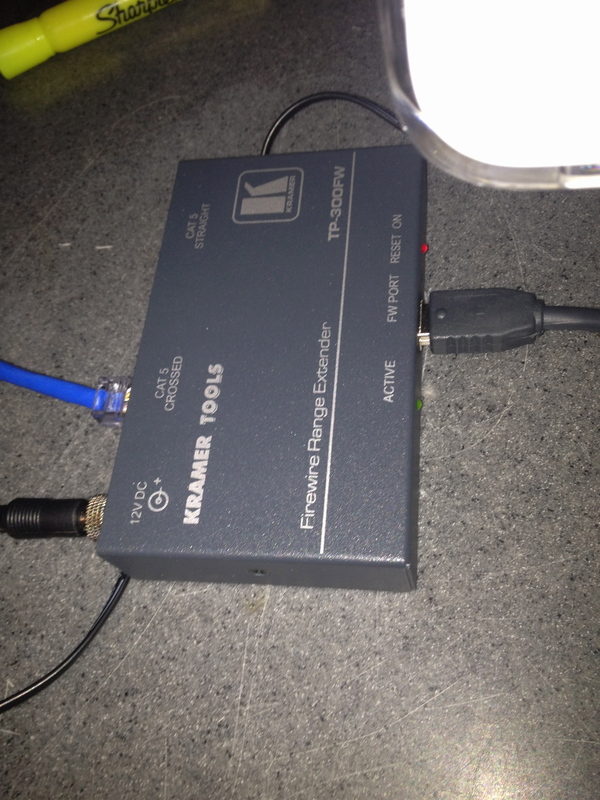 I had a wireless network that I patched into and streamed the event using Ustream.tv. I was shocked when hundreds tuned in to watch the event live and another 1,600 or so have watched the video. In the spring I increased the degree of difficulty by adding a second camera, and basically jerry-rigging a way to combine the two streams using two MacBook Pros and Skype. I didn’t want to go through that again, so I consulted with my now real world (formerly just Twitter) friend Hans Mundahl at New Hampton School. Here’s the set-up I came up with. Of course, I did this all the week before the event. Why do things in August when you can do them under the gun. These little babies were the key to having two cameras (that and the iMac with two FireWire inputs). I’m not going to mention that it took me an entire day to figure out why they weren’t working only to realize that the iMac’s software hadn’t been updated since the Bush administration. Video over cat-5 has a range of 300m (330ft for us Americans). This allowed me to set up the cameras at opposite side of the Chapel, and run the cables underneath the floor, along the wall, and into the sacristy in the back of the Chapel where I was set up with my iMac. I simply set the camera up, plugged in the FireWire to the camera and then to the converter box, plugged the cat-5 into the box and turned on the power. That cat-5 ran into another converter box and from there I ran an 8-pin FireWire from the box directly into the iMac. The one problem I ran into (which resulted in F bombs in the sacristy) was a bandwidth issue. The system kept freezing and crashing for the first 30 minutes until I turned down the quality of the stream. It turns out that we don’t have very fast upload speeds here and even though I was hardwired in, I was trying to push water from a fire hose through a soda straw. Once I turned it down to the lowest setting, everything started working just fine. We had 300 watch it live, and the recording has been seen over 1,000 times as well. The video is up on Vimeo. Pro Tip: With Ustream you can sign up to suppress ads for one month, and then cancel. If you download your video before you cancel, it doesn’t have ads. You can then upload it to Vimeo where you will have a video of your event without annoying David Hasselhoff ads. This year wasn’t cheap. I probably spent close to $1,500 to get everything set up and we did pay to suppress ads. $1,000 of that was a one-time cost though, and I should have to spend any more on the tech stuff unless I want to upgrade my cameras (which I do). Thanks again to @hansmundahl for all of the help! Please stop comparing Usain Bolt to Michael Phelps. They are not the same. Please stop saying that what Usain has done is more impressive than what Michael Phelps did. It’s not. It is impressive, but it’s not as impressive as what Michael Phelps accomplished. Please don’t forget what Phelps did or diminish it by comparing it to 2 events in track and field. 1. Usain Bolt raced in two races (not including qualifiers over) three days. He dominated both races, showboating through the finish of the 100m. He set two world records while doing so. Michael Phelps raced in 8 finals (as many races as Bolt raced in total) over one week. He set world records in 7 of his 8 finals. He dominated in most. He did so with class and without showboating. 2. Bolt ran the 100m and the 200m. Michael Phelps raced in the 100 fly, 200 fly, 200 IM, 400 IM, 200 free, 4×100 free relay, 4×200 free relay, and 4×100 medley relay. This is the equivilent of running the 100m, the 100m hurdles, the 200m, the 200m hurdles, the 800m, the 1500m, the 4x100m relay and the 4×400 relay. Bolt became the first person since Carl Lewis to win both events in the same Olympics. Okay, that’s been a long time. I get it. But what they are telling you is that Bolt is the ninth person to acheive this feat. Here’s the list. Phelps is the only person to ever have won 8 medals in one Olympics. He’s the only athlete ever to win 14 gold medals. Here’s the list: Michael Phelps. 4. Everybody runs. Not everybody does the butterfly. I saw this argument in an article posted on somebody’s bulletin board. Really? That’s why Bolt’s accomplishment is more impressive? Because everybody can run? Seriously? I ran in high school. I was slow. I swam in college. I was slow. What the hell do either of my athletic talents have to do with Bolt’s? Nothing. They’re both better. I really don’t see how you can honestly compare the two accomplishments. What Bolt has done in his two races is incredible, but I bet we’ll see it again. Phelps? We may see that again too, but we’ll see another 100-200 before we see 8 golds in one Olympics and before we see anyone overtake Phelps’ career total. Nicely done. Quick intro into what Datamark does, and then onto the presentation. Rule #1 Ask for forgiveness after the fact! I’m right on with this. Do it an deal with the consequences after the fact. I continue to hate Blogger’s Italics issues in Firefox. The admission staff should be on Facebook. I have mixed feelings about this and whether or not we should be totally on there. I think it depends on age. It would freak me out to see my director and/or my VP on there. I don’t think it’s worthwhile to have them on there. Just more work and no value. Young admission officers, yes. They definitely should be there. I also feel strongly that people who are making marketing decisions regarding new media and Facebook should be on there and embedded into the culture. Otherwise they’re making decisions on a technology that they don’t understand. Blind leading the blind sort of situation. If you don’t have a Facebook profile, you don’t get a vote. There I go getting all worked up again. I really need to blow up that useless Office of Admission Facebook page. I need to talk with ACP about creating a general page. Yup! You can’t market on these things! I wonder how he recommends directing traffic to these things? waybackmachine Here’s where SMC has been in since 1997. That’s me in the orange and blue shirt walking in front of our library in 2000.